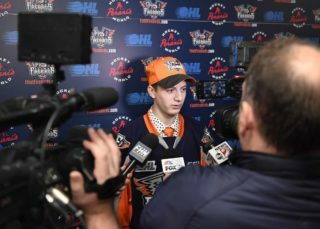 Flint, Mich. – The Flint Firebirds announced today that defenseman Tyler Deline (pronounced Duh-Line) has committed to an Ontario Hockey League (OHL) standard player agreement and education package with the club. 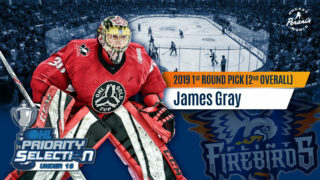 Deline, a native of Peterborough, Ont., was selected by the Firebirds in the sixth round (102nd overall) of the 2018 OHL Draft. The 5-foot-10, 150-pound left defenseman tallied 19 points (5G, 14A) in 35 games with the Peterborough Petes AAA hockey team last season. This season, Deline has 10 points (2G, 8A) and 36 penalty minutes in 20 games with the Clarington Toros (OMHA-ETA) Midget AAA hockey team. He also recorded two points in four Junior A contests with the Pickering Panthers of the Ontario Junior Hockey League (OJHL) this campaign. Deline earned the Peterborough Minor Hockey ‘James Johnston Memorial Award’ which is presented annually to a minor Petes player who exemplifies James Johnston’s character and skill. 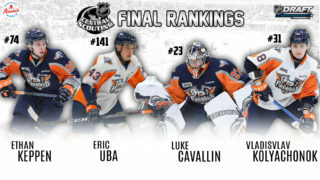 Deline will wear #44 for the Firebirds and is expected to make his OHL debut this Saturday, Jan. 5 when the Firebirds host the Sudbury Wolves at the Dort Federal Credit Union Event Center at 7 p.m.